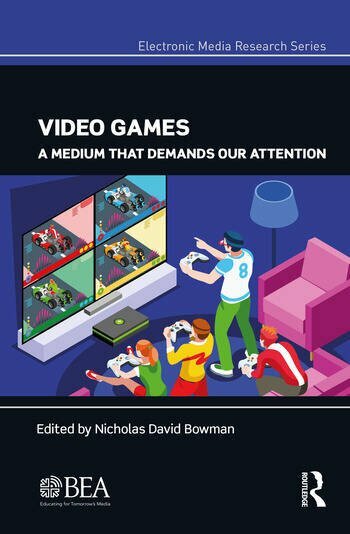 This entry in the BEA Electronic Media Research Series, born out of the April 2017 BEA Research Symposium, takes a look at video games, outlining the characteristics of them as cognitive, emotional, physical, and social demanding technologies, and introduces readers to current research on video games. The diverse array of contributors in this volume offer bleeding-edge perspectives on both current and emerging scholarship. The chapters here contain radical approaches that add to the literature on electronic media studies generally and video game studies specifically. By taking such a forward-looking approach, this volume aims to collect foundational writings for the future of gaming studies. Nicholas David Bowman (Ph.D., Michigan State University) is an Associate Professor in the Department of Communication Studies at West Virginia University, where he founded and directs the Interaction Lab (#ixlab). His work considers the intersection of communication technology and human interaction, and the manner in which mediated communication places a variety of different demands on users. He has authored or co-authored over 120 peer-reviewed manuscripts and book chapters related to these issues, and his work has been recognized by regional, national, and international associations. He is the current editor of Communication Research Reports and is an associate editor of Journal of Media Psychology, and he serves on a number of editorial boards, external review panels, and grant committees.